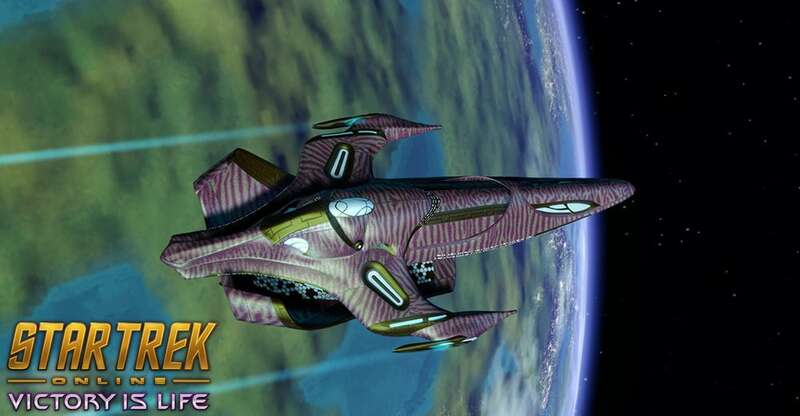 During Star Trek Online’s 2018 Summer Event you will be able to obtain Lohlunat Prize Vouchers (2018) by participating in the “Flying High” event on a daily basis. These Prize Vouchers can be earned once per day, and used to complete an Event Reputation project to obtain the Vorgon Ytijara Dreadnought Cruiser [T6]! This project requires 1000 Lohlunat Prize Vouchers (2018). Once this starship is obtained by any character on your account, any characters on this account can claim the Vorgon Ytijara Dreadnought Cruiser [T6] from the Account Claim tab within the Event Store (in the Event Reputation window). The Ytijara Dreadnought Cruiser strikes a balance in the Vorgon fleets, balancing somewhere between the massive battle station of the Ryn'kodan and the sleek maneuverable strike ship of the Xyfius. Still robust and utilitarian, the Ytijara is intended to give as good as it gets when properly outfitted. This starship features a Lieutenant Commander Universal/Temporal Operative Specialist seat. A starship equipped with this console is capable of generating a beam that will drain energy from a target's structural integrity field over time. However, to power this devastating weapon, the starship firing the Inverter must first drain a portion of its own structural integrity field. The starship that fires the SIF Inverter will suffer heavy hull damage, and then rapidly drain a massive amount of energy from its target's structural integrity field, while dealing catastrophic damage to the target's hull. This console provides as passive bonus to Hull Restoration skill and Maximum Hull Capacity. This console mod can only be equipped on Vorgon starships and you may only equip a single one of these consoles at a time. After achieving Level 5 in your Vorgon Ytijara Dreadnought Cruiser (T6), you will unlock the “S.I.F. Burst” Starship Trait. While this Starship Trait is slotted, activating any Hull Healing Bridge Officer Ability will cause enemies within 3km to suffer radiation damage over time.